Sleep I think happened at some point during the night. The air con was keeping me cool if nothing else! I was awake well before my alarm and dozing so I must have had some shut eye. We had a quick briefing from Marlon after an interesting selection in the buffet breakfast laid out in the rooftop restaurant on the 5th floor. Freshly made eggs & pancakes, what looked like blamonge, an array of breads some which were sort of drizzled with chocolate. A couple of pastries amongst cold meats etc and some suspicious looking vegetable and pasta dishes. An array from potentially every potential guest from around the world! Met the rest of the group that were already here & had a few bits of info given to us and background. Thankfully he had cheered up considerably from the night before, I was already drafting the complaint letter as I tried to get to sleep! 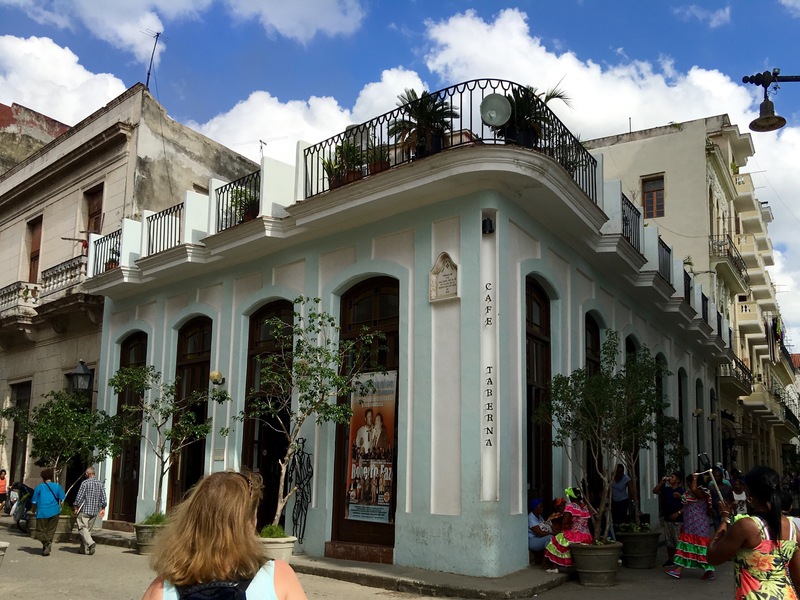 We had the money explained – essentially Cuba has two currencies in circulation. Convertibles – used every day & what we changed money into and then the Cuban Pesos which is mainly used to pay for state run things and so unlikely that we would need it if at all. It was the Cuban pesos that Cubans are paid their wages in and bills etc and some transport. It’s not just tourists that we would see queuing at the exchange houses but Cubans turning pesos into CUCs. You can withdraw from a cash point and would be charged 3% of withdrawal as a fee and when paying for anything on card – 11% He explained that he had encouraged us to change at airport as no commission rate and also he would show us the queues today – they would be long. Cubans queue for everything. We’d need passports to change money but didn’t need to carry them with us all the time. 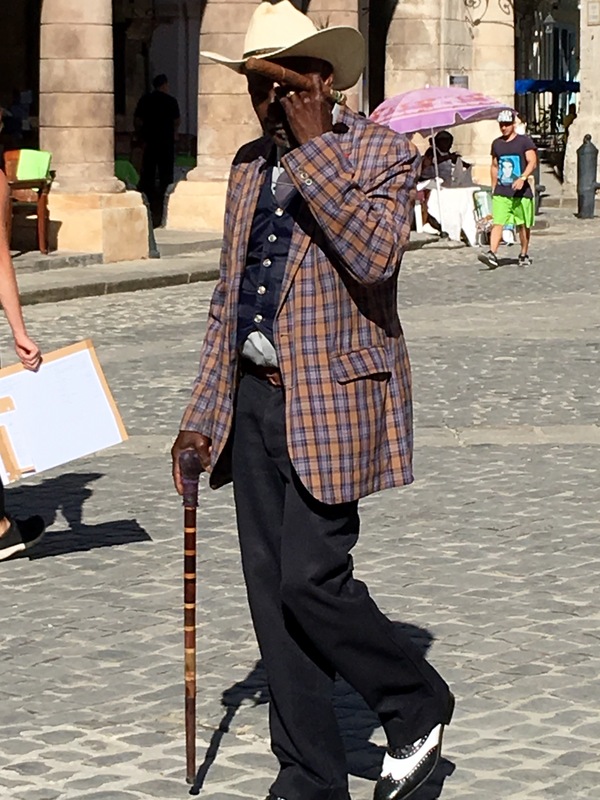 He came out with some great sayings – my favourite which I think could potentially sum up my experience being ‘In Cuba – everything is maybe!’ meaning everything happens as its meant to less than 50% of the time. Need to keep that in mind me thinks! We talked about lunches and were told that in Cuba we have only 2 types of sandwiches – ham and cheese or cheese and ham. Good job either will do really! We headed off and I could tell I was literally going to melt. Grateful that I had only brought with me the clothing for the sweltering heat! I’m not a shorts person and I failed to pack my skorts but this would have been the time for them! Flip flops a go go and went with lenses today (having discovered at the Hilton at Gatwick that I had 5 days of 1 lense and 15 days of another – I’m going to have to restrict when I can wear them!) and was grateful as my glasses would have slipped off my nose in the sweaty state I was in! The old school American cars were everywhere – it was awesome. Next to our hotel (The Plaza Hotel) is a new hotel being built and upgraded to be the most expensive hotel in Havana to be able to accomodate the expected American influx in the next couple of years if the restrictions and so on ever get lifted and current political issues solved. Marlon’s first job was in the 5th floor teaching English as a foreign language to secondary kids. 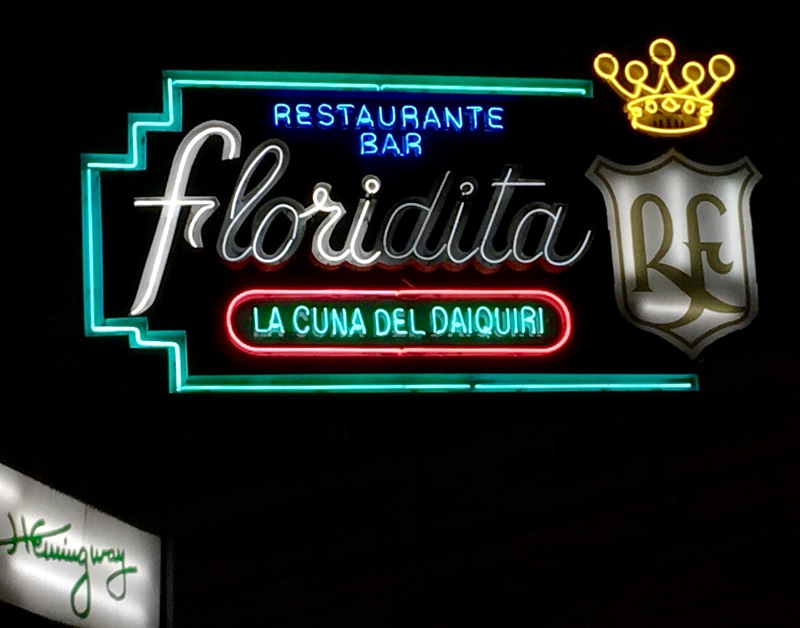 It’s not far from El Floridita which is the bar that they say Hemingway drank his daquiries from. I have a feeling we might well be partaking in one this evening! Walking down into the old centre I soaked in the surroundings, from street sellers trying to flog you hats and fans to the extensive queues outside the exchange houses. The cobbled streets and fine architectural fronts of buildings, often a facade for a dilapidated building in behind. The noise of the Spanish Cuban being spoken at top speed by the locals to the occasional loud American accent. It was a bustling vibrant centre awash with locals and tourists alike. We paused every now and then in the shaded areas (thank god) to hear a bit of the history of the location or what the buildings were that we were seeing. We walked mainly down pedestrianised streets, it wasn’t until we were walking down roads with the cars that the time warp effect kicked in. It was as if you were walking on a film set of say Casablanca or Grease even – clearly the Caribbean version of the films of that era. Our walking tour took us primarily to the four main squares in the old town. The first being the Cathedral Square where we heard a little more about the religion in Cuba. Primarily Catholic but there is also Santeria. It stems from the beliefs of the Yoruba people of Western Africa who would have originally come over to Cuba as slaves. As they were forbidden by the Spanish to practise their faith the slaves used to find ways of hiding images of their gods behind those of Catholic saints to whom they we forced to pay homage. It was because of this that for example the patron saint of Cuba is the Virgen de la Caridad del Cobre and she also embodies the orisha known as Oshun who is the goddess of femininity and are both believed to provide protection during birth. She is always depicted in yellow to represent honey and sweet things and of course, fertility. The cathedral was dedicated to her. A rather baroque looking building with rather splendid three other sides hat formed a courtyard effect. It was here that we established that Cubans always spot the tourists and are always wanting a contribution for their efforts. The two ladies who planted smackers on one of the gentlemen on the tours face to the elderly gentleman in all his finery pretend smoking the biggest, fattest cigar that you’d ever seen! From here we moved on to the Plaza Armas another stunning square with beautiful architecture all of different styles this time however. The centre was full with greenery and surrounding this were hoards of second hand book sellers. Serious revolution magazines and artifacts (the cynic in me doubted their originality) as well as the books were for sale. From here it was a short stroll to Plaza de San Francisco which had a whole load of highly decorated sculptures in it that reminded me of the Shaun figures and so on that have recently been in Bristol. It’s just off this square where the cruise ships dock as the Terminal Sierra Maestra pretty much takes up one full side of the square making it feel rather open. The St Francis of Assisi church is also found in this square – though it’s now more of a museum and concert location rather than an active church. There’s not much to this particular square it must be said and as a result we passed through it quite quickly and on to the Plaza Vieja (Old Square – though ironically not actually so). The Plaza Vieja is the most redeveloped spots in Habana Vieja having been repaved and the majority of the facades of the buildings returned to their original state. A large fountain at the centre of the square was bizarrely surrounded by fencing but I couldn’t quite work out why. It was clear why this square was seen as the focus for the local community, ideal for a market day or festival and is now a centre for urban activity. Just off this square is the Cafe Taberna where we would be returning a little later in the day for our salsa class and quick cocktail making lesson. Mad dogs and Englishmen go out in the midday sun and it was time for some food as we were starting to get peckish and also rather thirsty. I was sweating bucket loads, it was most unpleasant. 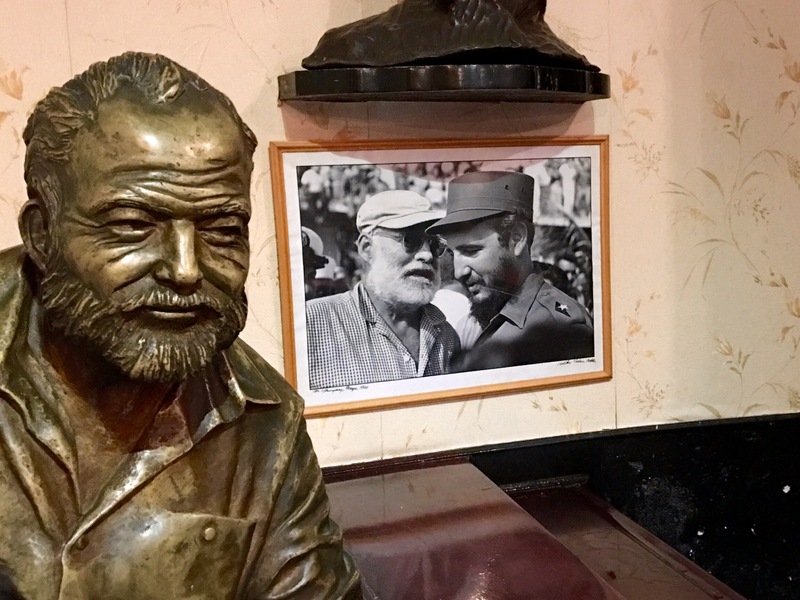 Marlon took us for a cheese & ham or ham & cheese sandwich at the Hotel Ambos Mundos, a well known hotel and Havana classic built in the early 20s that was a base for Ernest Hemingway for around 10 years from 1932. It’s thought that it was from here that he wrote Death in the Afternoon and possibly started For whom the bell tolls (I’m not sure I’ve ever read a Hemingway book I must say to all of these references to him, despite knowing who he is are rather going over my head! On the to do list I think for the new year). There are amazing roof top views of the city from here as the bar was on the top floor. Most of us decided not to wait for the lift, instantly regretted that decision on about floor three with tired and aching legs from the extra burst of energy in the heat. The lift that had clearly been there since the building was first built was a rather spectacular caged elevator and it was around this that we essentially wound our way to the top. 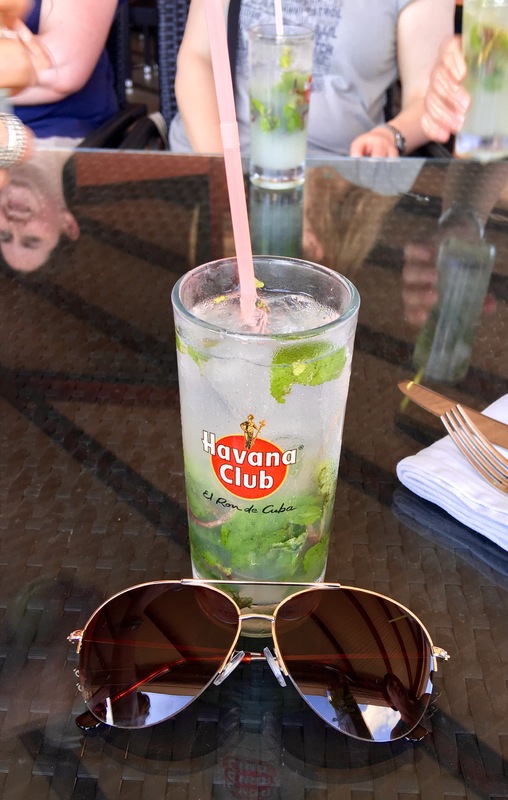 Mojitos all round pretty much and there was slightly more of an option on the food front but I stuck to the cheese and ham sarnie as that fitted the bill for me perfectly. It was seriously warm, with an hour of free time I was a little unsure what to do but decided on a stroll rather than heading back to the hotel. They weren’t all mine – promise!! I ended up in just wandering around the Plaza Armas again and down one of the streets that led off it past the castle and sort of did a loop down a few of the roads that we had not already walked down this morning spotted a lot of the old style cars ready for customers to take on rides around the city. I think that there will be a lot of us doing those tours at some point! Trying to take in the street life of Havana. The roads are so uneven it’s absurd – the suspension on all the cars must be shot to pieces. 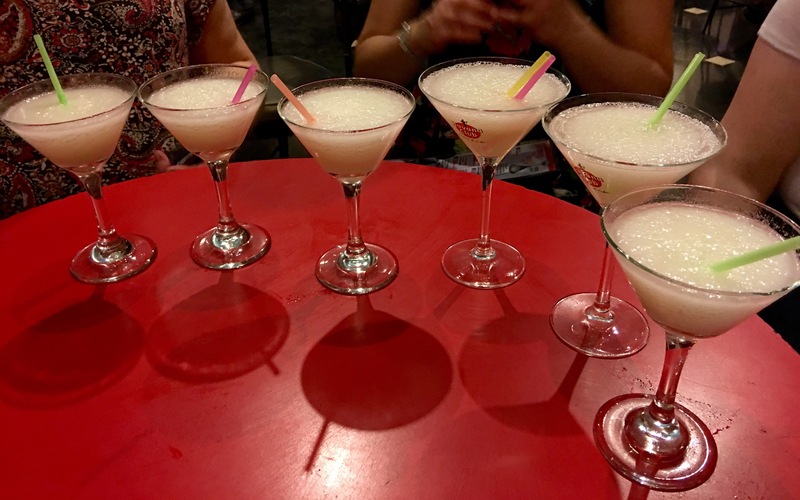 We headed early to the Salsa dancing location, Cafe Taberna, looking for a drink before the class, only to find that several others had a similar idea. We were the only ones in the bar really and the class went quickly as the band was ready to leave. Dressed all in white, many with dark glasses on they looked like a typical band from Cuba. All elderly gentlemen too it must be said. Honestly, dancing is just not my thing. I can do a very good funky chicken but that’s about it. Salsa dancing was really something that I was suddenly going to find an unbridled passion for. I hid out of sight as much as possible (from the instructor) to avoid being picked on. Over tired and over heating I could sense a sense of humour failure was rapidly approaching. Three forward steps, three back three to the side and then the other and foot behind. Oh this is easy was being muttered, oh god we have an audience – but they are just watching my arse as well. As hard as I tried to concentrate on my footwork, this was going to be an unmitigated disaster. The others went left I went right they went forward I was going left. Never have I been more grateful for a class to end (well bar the one with the Ofsted inspector watching & my class just misbehaving at EVERY turn – but I digress). Then came the bit of the prebooked activity that was more up my street – the cocktail making class. 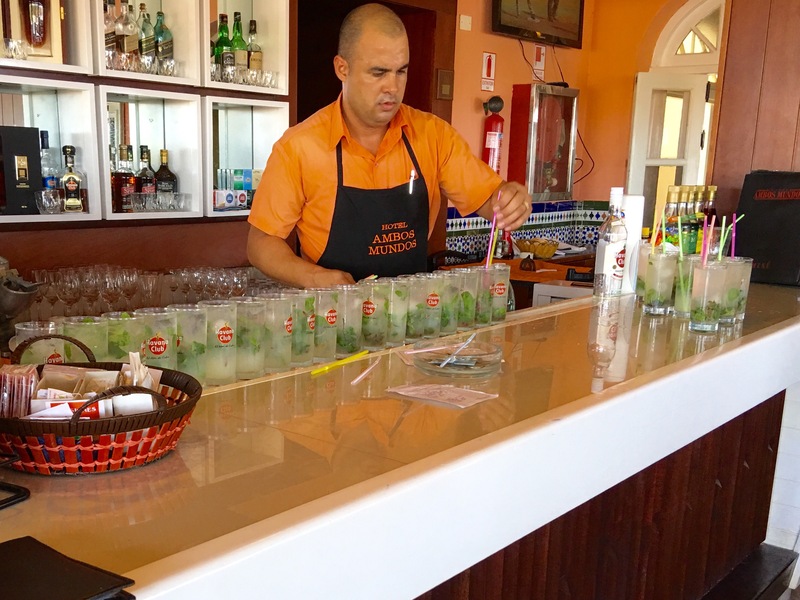 This was more of a watch me make 15 mojitos type of affair if I’m honest. I’m not arguing – I mean we drank them. There seemed to be a hell of a lot of rum going in them all it must be said. Apparently you count to ten when pouring it??!!!! It must be watered down for tourists or something as despite it tasting strong, it had little effect on me? We had a few more and a few were made by members of the group – mainly as a photo opportunity more than anything. Tat shopping followed the salsa affair on our way back to the hotel. A very tat-tastic market was spotted on the way into the old town area and so that was what we tried heading back to find. A few fridge magnets and key rings purchased and a couple of beautiful mounted photos which I intend on framing once home. Our last bit of shopping before heading back to the hotel was to stock up on some water, we would need some for the walk tomorrow in the Vinales region if not just in general for when in our rooms to try rehydrating from the heat. We hit the supermarket round the corner from the hotel. This was a smack of reality in the face to put it mildly. 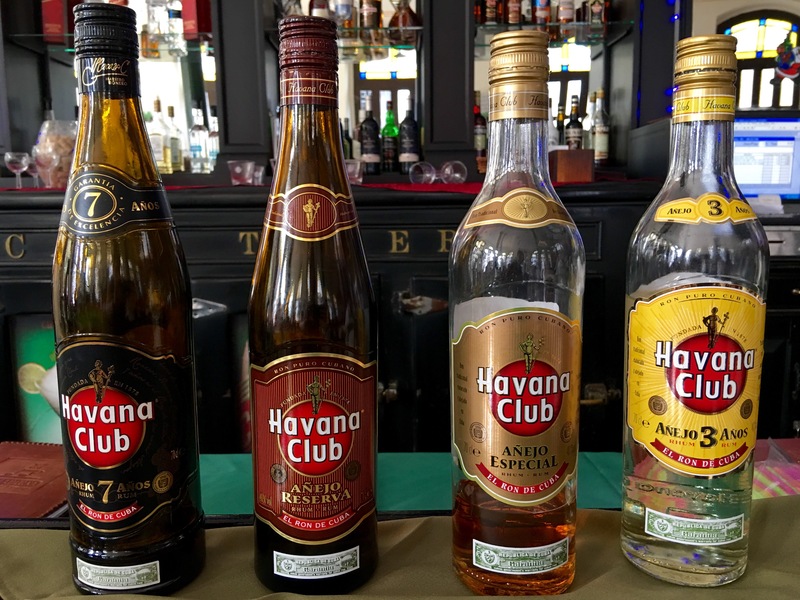 If not really appreciated a lot of things about Cuba, this one was the food situation. Not only was there no water (sold out and this was 4pm) but it was absolutely nothing like a conventional UK supermarket that you are possibly thinking of in your heads. It was a large room around the edge of which were glass cabinets with some goods in and shelves behind with more. Each was manned and your goods would be given to you from behind the counter & paid for by the looks of things. All that we could really see on offer were rice, rum, soft drinks, dried pasta, tins of things and honestly that looked about it. We went into the next door supermarket and it was essentially the same situation. This one had a hideously pungent smell of meat that had been left out in the heat. Still no water however. There are fridges in the rooms which we had water in and could pay for so we, as tourists, were lucky. I couldn’t quite believe that this was actually their supermarkets. We had a meal altogether in a restaurant not far from the Plaza Cathedral and was a rooftop terrace – nice to have a bit of a breeze. There were 15 of us at this stage and so it was a case of trying to remember who the hell was part of our group as we trundled our way through the streets of the Old Town. Normally I’m pretty spot on with my sense of direction and I knew where we were headed but had not consulted the map – too damned tired to do so!! It was a pretty decent set menu but I can see that I will indeed be having a pretty staple diet out here of chicken, rice and black beans. There were nasty peppers lurking in pretty much everything else or it was seafood. I will never get the idea of, in a climate like this, offering soup on the menu as the only option. Trying to establish if there were peppers in that too or shell fish ended up later in the week just getting way too difficult and I’d pretend to sup the soup from the spoon but have no more than a mouthful at that. Of course we had the musical accompaniment during dinner which blatantly none of us were listening to but yet the tips basket was waved precariously under all of our noses until someone threw some coins in so they would also stop trying to sell us their cd as well. This, we could all tell, would become a regular thing soon enough! 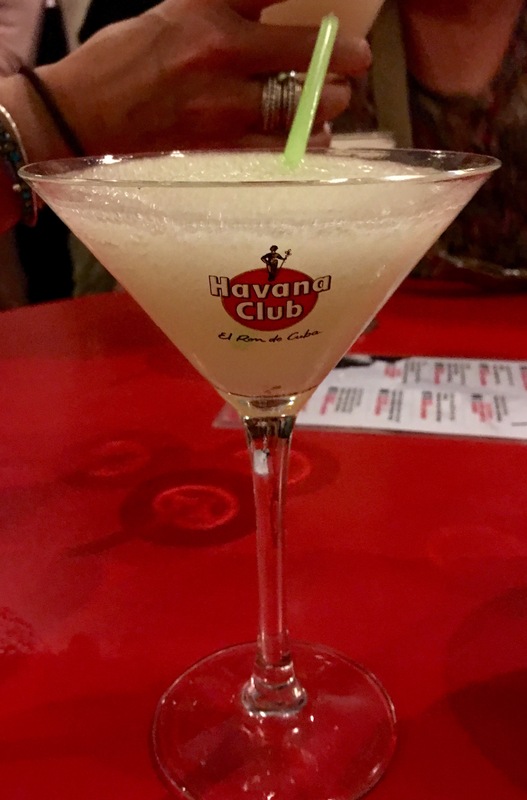 Posted on December 28, 2015, in Cuba and tagged Bar, cocktails, Cuba, culture, daquiri, Ernest Hemingway, Havana, history, hot, humid, mojito, queuing, salsa, travel, walking tour. Bookmark the permalink. Leave a comment.